Remember the Waldo Canyon fire? Remember the pictures of the homes lost, the dreams shattered? That was a good thing. Really. The Waldo Canyon fire, as bad as it was, could give the Colorado Springs economy a significant boost over the next five years as homes are restored, rebuilt and refurnished. Initial insurance claims for the contents and homes damaged, including 346 structures that were a total loss, are at about $353 million, said economist Tom Zwirlein, director of the Southern Colorado Economic Forum. Of that amount, about $151 million could work its way into additional dollars spent in the El Paso County economy over the next five years, creating 760 net new jobs, said Zwirlein, who is also a professor of finance at the University of Colorado at Colorado Springs. Yes, I was being sarcastic. To be fair to the writer of the article, he does go on to mention the toll that the fire took. The calculations don't account for the lost productivity from the more than 32,000 people displaced in June, not to mention the dollars lost when businesses shuttered and tourists stayed away. And they can't begin to put a value on the emotional trauma suffered or the two lives lost. But they do highlight how even disasters can generate unexpected opportunities as communities rebuild. So other than that, how'd you like the play Mrs. Lincoln? (HT to E Frank Stephenson for the link above and for the Mrs. Lincoln line). The scarcity problem: resources, and by extension the goods and services made with them, are more scarce at any point in time than the amount humans want. Therefore, stuff must be rationed. When the price system, for whatever reason, fails to work as a rationing system, something else must take its place. With long gas lines persisting more than a week after Superstorm Sandy, New York imposed a gasoline rationing plan Thursday that lets motorists fill up every other day. Police will be at gas stations Friday morning to enforce the new system in New York City and on Long Island. Gas will be available to drivers with license-plate numbers ending in an odd number or a letter on Friday. On Saturday, drivers with license plates that end in even numbers or zero can fuel up. Belleville officials have passed an ordinance rationing gas — the kind of law not seen in these parts since the national gas crisis in the late 1970s. The ordinance, approved Thursday night, will take effect Monday. The last digit on the license plate number of Belleville residents will determine what day they can purchase gas. Odd numbers will correspond to odd days and even numbers to even days, according to the ordinance. Monday, when the new rules take effect, is an odd day. Those looking to fill canisters will need to bring identification that has their address. The last digit on their address will be used to determine which day they can purchase gas. Story here. As mentioned earlier on this blog, New Jersey has an anti-price gouging law that governor Christie has been waving around in the wake of Sandy. The result has been predicable. It's another gas line story from Sandy's wake. The video is here. On April 27th, 2011, the city of Tuscaloosa, Al. was ravaged by a tornado which killed over 50 people. On May 22nd, Joplin, Mo. was blasted by an EF-5 tornado that killed over 160 people. Both cities were heavily damaged, but which city is recovering faster? According to David Beito and economist Daniel Smith, Joplin. In Joplin, eight of 10 affected businesses have reopened, according to the city's Chamber of Commerce, while less than half in Tuscaloosa have even applied for building permits, according to city data we reviewed. Walgreens revived its Joplin store in what it calls a "record-setting" three months. In Tuscaloosa, a destroyed CVS still festers, undemolished. Large swaths of Tuscaloosa's main commercial thoroughfares remain vacant lots, and several destroyed businesses have decided to reopen elsewhere, in neighboring Northport. The reason for Joplin's successes and Tuscaloosa's shortcomings? In Tuscaloosa, officials sought to remake the urban landscape top-down, imposing a redevelopment plan on businesses. Joplin took a bottom-up approach, allowing businesses to take the lead in recovery. Tuscaloosa mayor Walt Maddox responds here. This brings to mind the question of what's the best way to develop a society: top-down or bottom-up. A top-down society is an Astroturf society, essentially imagined and designed by rulers who then impose their will on people. A bottom-up society, on the other hand, is a grassroots society that develops organically, and it emerges from the decentralized actions of people. If Beito and Smith are correct, chalk another one up for spontaneous order. Hurricane Irene is bearing down on the east coast of the United States, and the economic outlook is not encouraging. The Wall Street Journal called the hurricane an "economic worst-case scenario." The Wall Street Journal also cited a study by Munich Re which said that at least $100 billion in insured losses from an East Coast hurricane could ravage an already unstable economy. This figure, he added, does not include loss of productivity or loss of human life. What's more, because New York City is extremely densely populated (you've seen the borderline-line scary roommate situations), the impact of a major hurricane, economic and human, could be devastating. A hurricane capable of 100 mph winds could raise the level of New York Harbor by 10 to 15 feet, ravaging neighborhoods, drowning subways in saltwater, and taking down power lines. The article, written by Elvira Veksler, stands out to me because there is no mention of the supposedly stimulating effects of natural disasters. That's a good thing. It's often - incorrectly - argued that natural disasters help an economy because it forces people to begin repair work which encourages people to spend money. But the problem with that theory is that it ignores the fact that natural disasters kill people and destroy assets. Yes, natural disasters drive people to replace those assets, but that spending drives people to spend less on other things. They do not stimulate an economy. The power outages and shuttered airports may stop the engines of commerce for several days, but Hurricane Irene might have provided some short-term economic stimulus as billions of dollars will likely be spent to repair the damage to the East Coast over the weekend. Sigh. Story here. Link via Doug Mataconis who has thoughts here. If disasters were good things, we'd expect people to destroy their own property or we'd expect governments to bomb their citizens' property. How often do we see people destroying their stuff and, when we ask them why, they answer "Because it makes me better off"? Disasters destroy assets and lives, and while we can't replace the lives, we can replace the assets. So people spend money to rebuild, money that would have been spent on other things and would have stimulated other industries. People may have gone to movies, or bought musical instruments, or new cars, or any number of other things. But nature forced their hands to spend on repairs. So instead of stimulating spending in an economy, disasters merely redistribute spending that would have occured into the construction industry, not to mention the assets (wealth) that is destroyed by the disaster. This may be good for the construction industry, but it is not costless to society. Like we profs like to tell our Principles of Econ students: "there is no such thing as a free lunch." There is also no such thing as a stimulative disaster. Motives vs. Results in Emergency Relief: Which is More Important? If I may paraphrase Adam Smith: "It is not from the benevolence of the people of Wal Mart or Home Depot that we expect our emergency relief supplies, but from their regard to their own interest". Forecasters don't expect Hurricane Irene to make landfall until Saturday. But for nearly a week now, big-box retailers like Walmart and Home Depot have been getting ready. They've deployed hundreds of trucks carrying everything from plywood to Pop-Tarts to stores in the storm's path. It's all possible because these retailers have turned hurricane preparation into a science — one that government emergency agencies have begun to embrace. At Home Depot's Hurricane Command Center in Atlanta, for example, about 100 associates have been trying to anticipate how Irene will affect its East Coast stores from the Carolinas to New York. At times like this, the Command Center looks much like NASA Mission Control during a shuttle launch, says Russ Householder, the company's emergency-response captain. "We've got all the key news agencies on the big screens up front," he says. "We're also monitoring our store sales so we can better be in tune to what's happening in our stores, and we're also connected live one-on-one with district managers in the impacted areas." Story here. John Palmer has comments here. Don Boudreaux's comments are here. Here's a link about how Wal Mart handles its logistics (link via Craig Newmark). In a hefty 218-page report, the Department of Homeland Security's inspector general writes that the federal government and FEMA received "widespread criticism for a slow and ineffective response to Hurricane Katrina." Slow and ineffective are unfortunately near synonymous with big bureaucracies like FEMA, which is why I'm thankful for private responses. I used to work as an assistant manager at Walgreens in Omaha, Ne. In 1988, the year before I moved to Omaha, a severe storm rolled through town and knocked out power (it produced a tornado across the river in Council Bluffs). 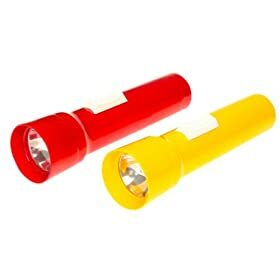 The store manager at one of the stores had ordered some cheap, plastic flashlights - (remember the Eveready ones?) for an upcoming ad. After the storm knocked out power, he had a table display in the front of the store cleared of merchandise and he put a bunch of those flashlights on the display. He then priced the flashlights at $5 (they normally sold for about $1 back in the late 80's). Was that a high price for those flashlights? Yes. Did some customers feel they were being taken advantage of? Almost certainly. But the market before the storm wasn't the same as that just after the storm. The demand for flashlights increased because of the storm and we'd expect the price of flashlights to also increase. All the manager was doing was responding as we'd expect any manager in any market to a demand increase. If he doesn't increase his price, he may run out of flashlights. That's not good for those who want to buy them but can't. It also doesn't make the store look good when they come on sale and the store is out. Sure, the manager was only responding to the profit motive. So what? If not via higher prices, how is he supposed to determine who gets flashlights and who doesn't? And why is that way better? If I may once again paraphrase Adam Smith: "It is not from the benevolence of the Walgreens manager that we expect our flashlights, but from his regard to his own interest". While some people might huff and puff about the motives of Wal Mart and Home Depot and Walgreen managers, I don't care much about the motives. What I want is results..
Long-time readers know I am no fan of price gouging laws because prices of many items and services are naturally going to spike when natural disaters hit. The demands for things like bottled water, construction services, hotel rooms etc. necessarily increase dramatically when, at the same time, the local supplies of these goods get restricted. The simultaneous increase in demand and decrease in supply necessarily leads to higher prices as buyers try to get what they want and sellers try to allocate what they have. Price gouging laws act a bit like price ceilings by limiting the ability of buyers and sellers to trade above some "high" level. But what's high? What's "charging too much"? What's unfair? Who's to determine what's high and what's unfair? How are scarce resources supposed to get allocated to get people what they want? If anything, these laws make it more difficult for people to get bottled water, construction services, hotel rooms, etc. in a timely manner. If someone offers to sell someone else a bottle of water for $15, let the buyer decide whether that's fair or unfair. If someone offers to clear a tree off a house for $20,000, perhaps that person already has a lot of work to do, meaning the opportunity cost of taking on additional work is very high for him. Why shouldn't he be allowed to charge a high price? While the anti price gouging laws may sound like a good idea, in reality they do little but hamper relief efforts. As with anything, supply in demand has pushed the cost of the iodine pill into an astronomical price bracket with online auctions. This is not just in Japan, the US, Canada, and many other countries are experiencing this today. The run for this pill is on, with reports from countries no where near Japan seeing a rush from its citizens to get this product. Supplies are low and getting lower, with many suppliers already reporting they have exhausted their inventory. The Internet has played an amazing part in putting people in touch with one another after Japan’s earthquake and tsunami, but now it is playing a part in a darker side of the aftermath of this catastrophe. Iodine pills online are up for bid and going for as much as $540 a packet. The packet contains 14 pills, and its usual cost is about $10 a packet, according to CNN News this morning. I agree with Tyler. I think we can find QEII not guilty in this case. It's purely a rightward shift of demand caused by the damage Japan's recent earthquake did to some nuclear plants. But is it price gouging? 1. It sounds like the stimulus was more like an offset: increased federal spending was an offset for decreased state spending.according to this NBER paper by Aizenman and Pasricha. King Banaian argues that the stimulus created/saved a half a million jobs but that the long-run effects are "murkier." 2. Entitlement programs don't increase the number of rich people relative to the population. Markets tend to do that and it's reasonable to think that, at some point, we run out of "other people" to pay the way with entitlement programs. Mark Steyn argues that Greece is at this tipping point. Many American states are at similar points. If the US legislates an entitlement health program - Obamacare, for example - then it, as a nation, is moving closer to the point Greece is at today. "What could go wrong?" Greece may provide an answer. Via Craig Newmark. 3. On the one hand we have Haiti, an impoverished country hit by a magnitude 7 earthquake. The result was hundreds of thousands dead and terrible damage. On the other hand we have Chile, hit by a magnitude 8.8 earthquake, much, much worse than the quake that hit Haiti in terms of sheer seismic power (the Richter scale is based upon the base-10 logarithmic scale). Like the Haitian quake, this one was centered near a major city and it caused considerable damage. Unlike the Haitian quake, it also generated a tsunami that inundated coastal regions of Chile. It was a double whammy for Chile. But the death toll was much smaller than in Haiti (just over 700 dead from what I last saw). Why the difference in death tolls? One argument can be made that Chile's building codes were stricter than Haiti's. That is true. But you also have to point to Chile having enough wealth and income to be able to afford having stronger building codes. You have to be able to take care of the basics - basic food and shelter - first before you take care of the fancy stuff - fancy food and shelter. Where does wealth and income come from? Generally speaking, from strong market institutions (HT Art Carden). Why does Chile have stronger market institutions than Haiti? Bret Stephens points to Milton Friedman. Ironically, Friedman's Nobel Prize ceremony was punctuated with protests for his having been associated with the Chilean dictatorship. 4. "African Poverty is Falling" and it is "remarkably general." This is a very good thing. Via MR.